Back in 2012, CatTime reported on Corky, a cat who was found dragging his rear legs behind him on the side of the road in North Dakota. Although one of the cat’s rear legs had to be amputated, risky surgery straightened out his other limb. He now thrives at his forever home, and promotes helping other disabled and homeless pets. In late 2013, a kitten only a few weeks old was recovered from a suspected hoarding situation in the Chicago area. But the animal was different in that his rear legs were twisted like a pretzel forming a “W,” and in order to move, the kitty had to drag his legs behind him. The cat, named Stockings, was taken the Tree House Humane Society, a no-kill shelter in Chicago. 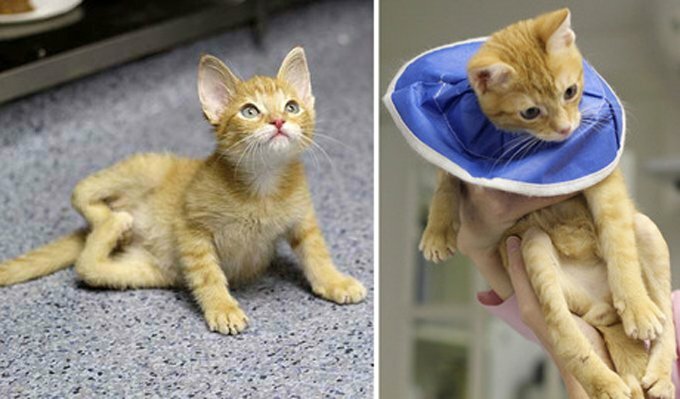 Being a kitten with pent-up energy, Stockings didn’t notice his disability – he just wanted to play like the other kittens, even if he fell on his face much of the time. But it was impossible for the cat to remain in his condition indefinitely, as his dragged limbs developed sores. The shelter turned to orthopedic veterinarian Dr. Steve Neihaus of the Chicago Veterinary Emergency & Specialty Center for a solution. The procedure involved cutting Stockings’ tendons so his legs could be uncurled and set in an extended position. After four surgeries, around-the-clock care, and rehabilitation, Stockings was finally able to use his rear legs. Something else also happened: Priscilla Cherry, his foster parent and veterinary technician at the CVESC, fell in love with the feline and gave him a forever home, just in time for the holidays. Although his rear legs have been straightened and are functional, Stockings will never have the full range of mobility or motion of other “normal” cats. Instead, the feline has learned to compensate by relying more on his front legs. With a household that includes two dogs, Stockings will need all the functionality he can get. After all, someone needs to keep his canine colleagues in line.